Sara Ahnell, a College of Education graduate in the Alternative M.Ed. 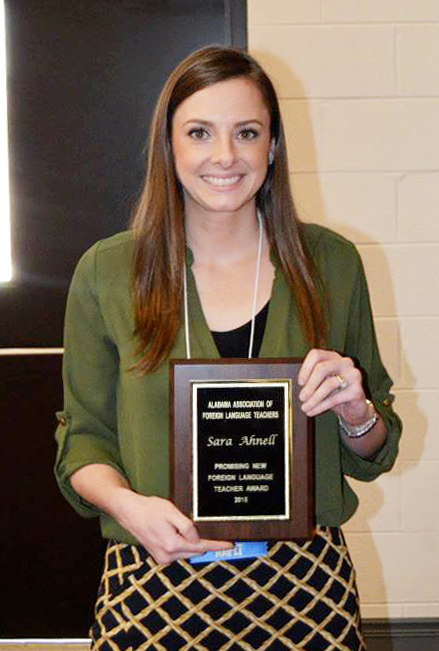 in Foreign Language Education program in French, was recently named as the winner of the Annual Promising New Foreign Language Teacher award. The award was presented by the Alabama Association of Foreign Language Teachers. She was nominated by her major professor, Dr. Sue Barry. Although Auburn’s Alternative M.Ed. requires five content-specific pedagogy classes, not all students excel in all aspects of teaching during their internship. According to Barry, this was not the case with Ahnell, who is now in her second year of teaching at Opelika High school.